On November 7, I had the opportunity to attend Inspiration to Action 2011, the annual unveiling of the Catalogue for Philanthropy – Greater Washington’s paper catalogue. Celebrating its ninth year, eighty-seven local non-profits are featured in the print version of the 2011-2012 catalogue, with an additional 250 plus non-profits featured on the Catalogue’s website (http://www.catalogueforphilanthropy-dc.org/cfpdc/index.php). I was invited to represent the Junior League of Washington, as three of our community partners – Bright Beginnings, Building Futures, and Higher Achievement – are featured in this year’s Catalogue. 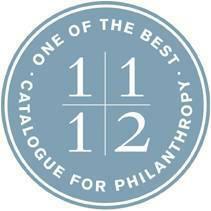 The Catalogue for Philanthropy seeks out the best of the best local nonprofits with an operating budget under $3 million. Organizations featured in the Catalogue must first apply, and then are put through a peer review process and must also demonstrate financial sustainability. The organizations ultimately selected to appear in the Catalogue represent a wide range of work in the greater Washington nonprofit community, from local charter schools to homeless shelters, from theater companies to international organizations. Members of the community can then use the Catalogue to make a donation to a charitable organization, knowing that their donation will have a high impact on a worthy organization. Other JLW community partners which are featured in the online Catalogue include Calvary Women’s Services, Doorways for Women and Families, Horton’s Kids, and IONA Senior Services. I am proud of the commitment the JLW has made to these seven community partners featured in the Catalogue through our trained volunteers, providing hands-on direct services and making an impact in the community. If you’re looking to give your money to a local organization that maximizes their resources, there’s no need to look any further than the organizations featured in the Catalogue for Philanthropy.